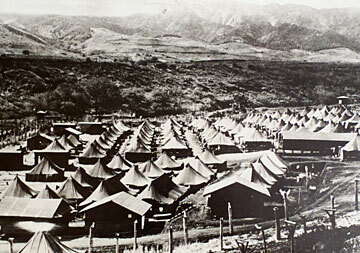 In Hawaii, Japanese Americans were detained during World War II at Honouliuli internment camp, west of Kunia Road and mauka of the present-day H-1 freeway. WASHINGTON » The House unanimously approved legislation yesterday that would create a $38 million grant program to preserve sites where Japanese Americans were detained during World War II, including a former internment camp at Honouliuli on Oahu. The voice vote came after a series of short, often emotional speeches in which advocates declared that the unfinished business after the country's national apology for the roundup of 120,000 Japanese Americans following the bombing of Pearl Harbor is to preserve what remains of the places where they were imprisoned. "It was one of the greatest suspensions of liberty in our nation's history, an avoidable consequence of racial prejudice and wartime hysteria," said Rep. Doris Matsui, D-Calif.
"These camps are the physical, tangible representation of our government's failure to protect the constitutional right of every American," she said. Matsui's parents met at the internment camp in Poston, Ariz., where she was born. The author of the House bill was Rep. Bill Thomas, R-Calif., who could barely hold back tears as he urged its passage. "Great people can make mistakes," Thomas said. "What you need to do is admit it so you don't make them again." That was the essential theme of yesterday's deliberations. A 1988 law offered an official apology and compensation for Japanese Americans and Alaska natives who were held in detention. The legislation yesterday was characterized as a way to turn the detention centers into monuments so that the memory of what had happened would not be lost. Identical legislation is pending in the Senate. 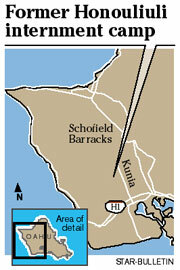 IN HAWAII, Japanese Americans were detained at Honouliuli internment camp, west of Kunia Road and mauka of the present-day H-1 freeway. U.S. Rep. Neil Abercrombie, D-Hawaii, said: "No action can cleanse the stain of internment completely or erase the suffering of those who endured it, but the 1988 apology and restitution bill authored by Sen. Spark Matsunaga was a big stride in that direction. "We took another step forward today. Preserving the internment sites will give future generations the opportunity to learn the lessons of the tragedy. That becomes increasingly important as memories of World War II fade into the past and the nation faces renewed challenges to the rule of law and constitutional rights which were violated wholesale by wartime internment." Floyd Mori, public affairs director for the Japanese American Citizens League, said that the swift action on the bill in the House is a good indication that the grant program is likely to be enacted next year. The legislation makes 10 internment sites eligible for grants, but money also could go to the preservation of assembly sites, including one in downtown Sacramento, Calif. Under the program, state or local groups would be able to receive grants covering up to 75 percent of the cost of preserving what remains of the detention centers, and to build interpretive or education facilities. In California the Tule Lake War Relocation Center in Modoc County would be a certain beneficiary. A recommendation to give the center national historic status is on the desk of Interior Secretary Gale Norton, and Rep. John Doolittle, R-Calif., and Sen. Dianne Feinstein, D-Calif., worked this year to get $200,000 to preserve the center's jail. In a letter to Norton in April, the Japanese American Citizens League said that of all the detention centers, "Tule Lake camp is perhaps the most historically significant," in part because of the structures that still remain. The Tule Lake camp is important also because of its unique role. In operation from 1942 to 1946, the center was infamous because in its later period it is where Japanese Americans who refused to sign loyalty oaths or who had criminal or behavioral problems were taken. At its peak, more than 18,000 were imprisoned there, and their inscriptions carved into the walls of the few remaining buildings can still be seen. Among those held at Tule Lake was Robert Matsui, then a toddler, and his family, who spent most of their internment at a camp in Idaho. The former Sacramento congressman died Jan. 1, and his widow, Doris Matsui, was elected to his seat in March. "By preserving the history behind these physical landmarks, new generations of Americans will learn the lessons of this tragic period -- and significantly, the lesson will not fade from our national memory," the congresswoman said.